I have been struggling with what to do with this anger, with this deep exhaustion that persists no matter how much I sleep. The hatred drains me. It makes me so tired and so sad. What can I do? I realize that I am extremely privileged to live in a world that is post-the Civil Rights Movement and post-the 19th amendment. I am privileged to be an American citizen and to have been given an excellent education. The people who came before me have fought long and hard for many of the basic rights and freedoms I enjoy. I am not forgetting that. I just feel there is so much more work that needs to be done and this election reminds me of that every single day. Yesterday, we hosted the “Mother’s of the Movement” at our Wake the Vote Hub to view the Up to Us art exhibit and speak on a panel. 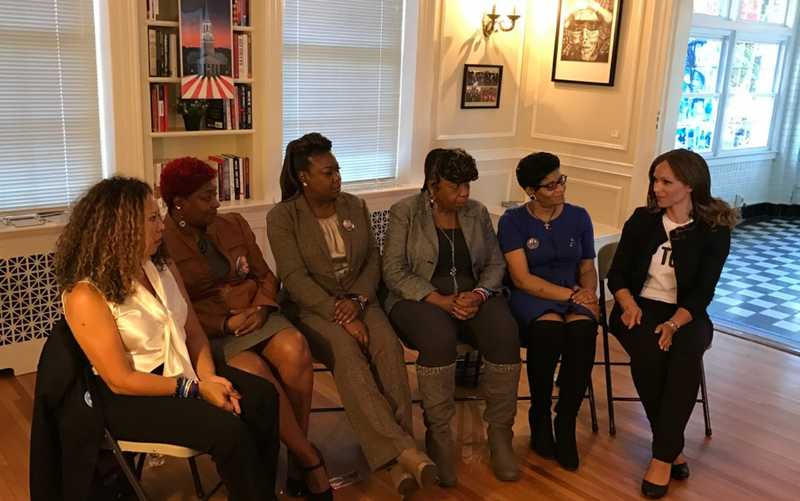 The Mothers have been on the campaign trail with Hillary for months now advocating for safer gun laws and changes to policy related to policing. They are speaking for their children lost to gun and police violence. While listening to them speak it struck me. They too are angry. They are furious or at least at one point they were. Many have found peace and comfort in their religion. They have turned that anger and that deep sorrow into action. The Mothers were incredibly strong and together they are a powerful voice for change. Their strength was inspiring. I finally really understand what it means to be “Stronger Together”. Older PostClinton or Trump- Who is More Qualified to be the President of the United States?